I’m more than excited to announce that I will be publishing a book soon that’s all about the work I do on a day-to-day basis with some incredibly creative people here at Whiteboard. In the book, you’ll find ideas that I believe could change the way developers and visionaries work together, and I’m really excited to share it with you. 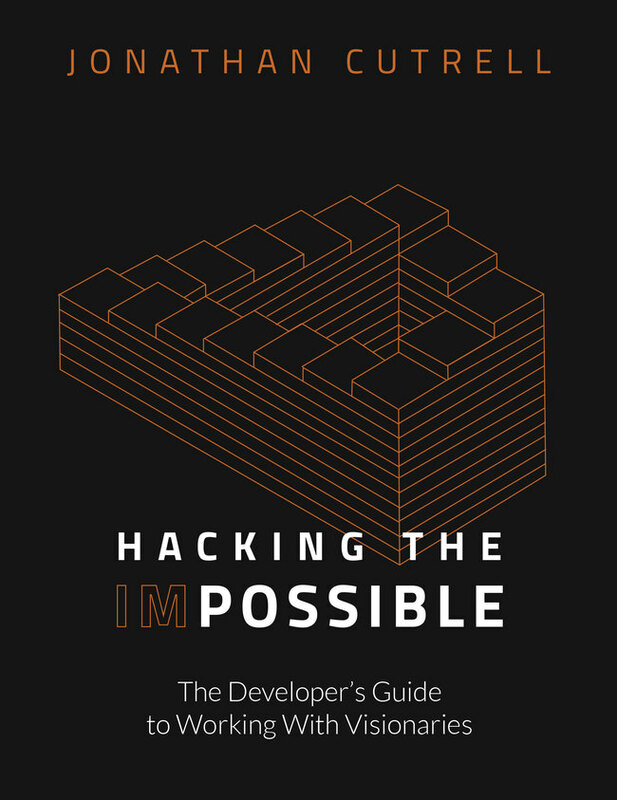 If you’re interested in learning more about the book in the upcoming days, drop by http://hackingtheimpossible.com and sign up for the mailing list, and then follow @hackimpossible on Twitter. If you work at a creative agency, you’ve almost certainly experienced the phenomenon of personality difference that Hacking The Impossible is all about. The two polar creative opposites - The Developer and The Visionary - sit in their corners of the room, each with entirely different understandings of what it means to work. The developer believes in concrete structure and receives in equal portions nerd-ridicule and geek-cred; the visionary follows the latest fashion trends and seems to shift from one idea to the next, living in complete oblivion to the complexity of technology. The developer is often accused of being anti-social, closed-minded, or pessimistic, while the visionary is accused of having their head in the clouds, getting wrapped up in impractical or downright impossible ideas. The truth, however, is that the powerful creative abilities of each of these polar opposite caricatures are held within their ability to be the extreme versions of themselves. The visionary holds keys to imagining the impossible things, and the developer’s job is to build the impossible. This book is about two things: how to work better with people, and how to use those skills to think about problems in a new light. This new light illuminates the path to innovation, and reminds you that with the right people in the right room at the right time, the impossible can be achieved. Don’t forget to sign up for the mailing list at http://hackingtheimpossible.com to receive periodic updates from me about the book! Written by Jonathan Cutrell, engineer and podcast host amongst other things. You can follow him on Twitter at @jcutrell.